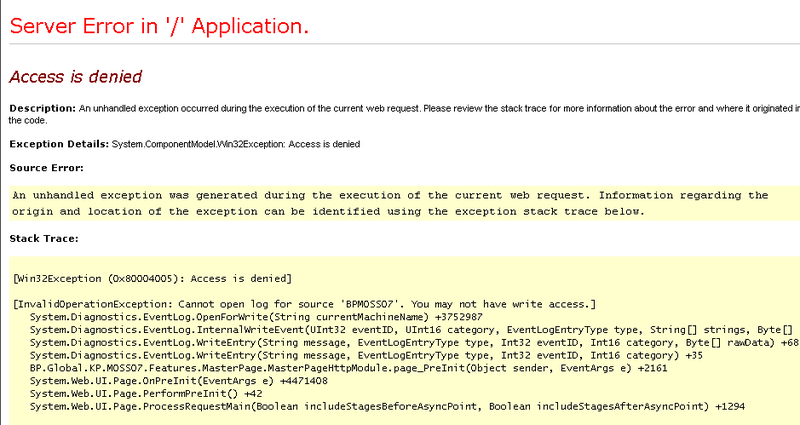 Enabled the stack trace and Turned off custom error message page to get the actual error. Error detail: System.ComponentModel.Win32Exception: Access is denied. Below it, in the stack trace, another exception popped: InvalidOperationException: Cannot open log for source ‘My_Web_Part’. You may not have write access. This is because non-administrators do not have the permission to write on the event log. So for this problem, just grant non-administrator users permission to write on the event log. Open registry editor by typing "regedit" in run box. The string is formatted as an SDDL, you can find more information about the format at Microsoft’s site. Always, Its a best practice to Backup registry before you do any change.